WT Tregs are expanded in a WAS patient following reversion of a pathogenic mutation. Peripheral blood mononuclear cells were analyzed by flow cytometry using antibodies to CD4, CD45RA, CD27, CD62L, WASp, and FOXP3. (A) Characterization of the CD4+FOXP3+ (Tregs) and CD4+FOXP3– (effector T cell [TEFF]) cell populations within the total lymphocyte gate. (B) WASp expression within the CD4+FOXP3+ Treg population demonstrating that approximately 25% of the patient’s Tregs are WASp+. (C) Identification of the naive CD4+CD27+CD45RA+ T cells within the CD4+FOXP3 TEFF cell population. Naive cells account for approximately 7% of the TEFF population in this patient. (D) Within the naive T cell compartment, only a small proportion of the cells (approximately 2%) are WASp+. (E) In comparison with the TEFF population, very few (<1%) CD27+CD45RA+ naive cells are present within the CD4+FOXP3+ Treg population. 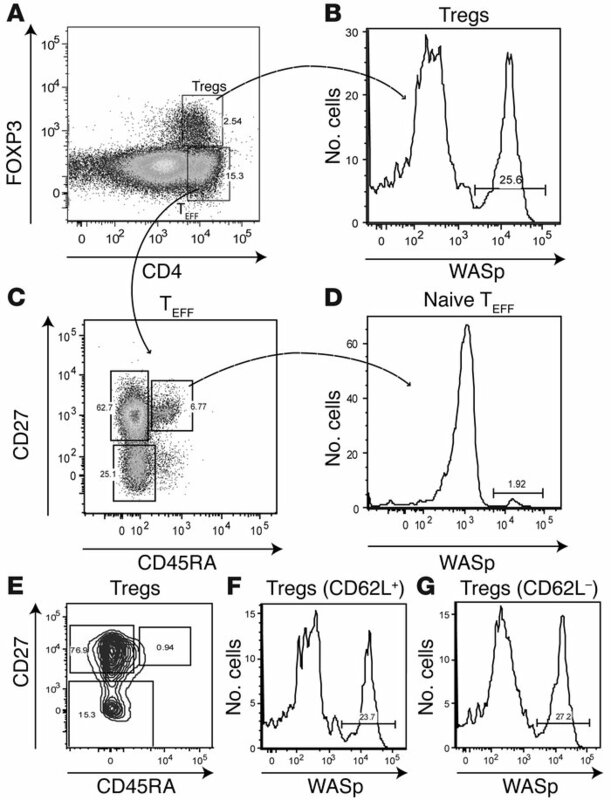 (F and G) Within the CD4+FOXP3+ Treg population, WASp+ cells account for equal percentages of the CD62L+ (F) and CD62L– (G) Treg subsets.